Look over there… wandering… slowly walking… bloodthirsty… ZOMBIES!!! 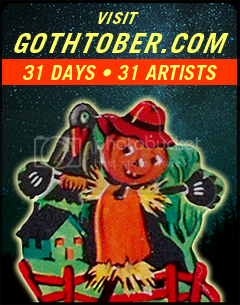 Click on Gothtober Pumpkin #11 and experience the thrilling dismay and scintillating misgivings of Pinkee Lee Estrange and Lenore Colina’s “Trick or Treat” an old timey movie starring some very hungry corpses in need of BRAINS!!! What would normally be a pretty standard errand for a pair of zombies, however, turns out to be more arduous than expected, as you will see from watching the film. A Gothtober merit award goes out to the actors (Aubrie Davis and Brian Grover) who played the zombies because they consented to ACTUALLY BEING BURIED IN THE GROUND for the opening scene. This puts them in league with many fine method actors, but especially Sissy Spacek who insisted on being stuck in a box and buried in the ground in order to film the super creepy end scene for “Carrie.” Brian DePalma refused to bury her himself, and got her husband to do it. Pinkee said that she dug the first grave in the front yard where the zombies live and she accidentally ran into some REMAINS! The previously existing plot held the skeleton of a family pet long buried quite awhile ago from the look of it. Pinkee apologized profusely, put the remains back and dug in a different spot! Gothtober would like to thank the ghosty dog for being an inordinate part of the artistic endeavors of our Gothtober contributors. 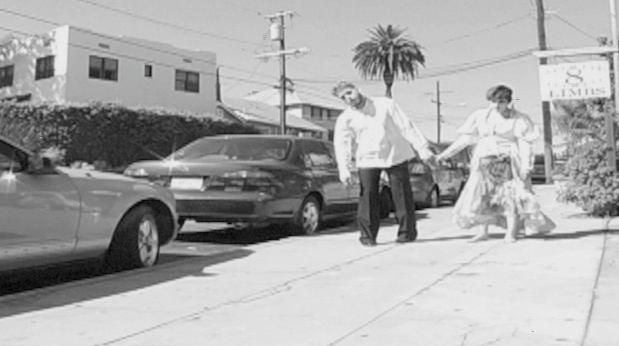 The film involved two days of shooting, and every scene was shot in Silverlake or Echo Park in beautiful Los Angeles, CA. Mostly I was just really worried about fingers getting slammed in the door! I’m sure the zombies would just think it was finger-eatin’ good.